Whew! 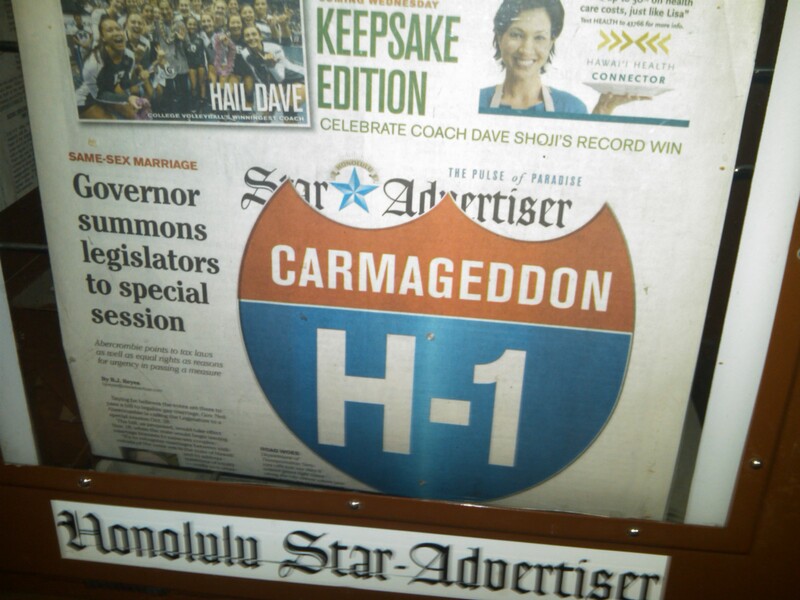 Honolulu is the setting for Carmageddon III! The H-1 is the major freeway that serves Honolulu. The Hawaii Department of Transportation is calling it the H-1 Freeway Rehabilitation Project while the Star-Advertiser, the city’s big newspaper, seems to prefer a sexier PR term. Nice! The first two Carmageddons on the 405 went smoothly but movie fans know that it’s often hard to pull off a competent trilogy. More on that after the jump. Rocky III — the one with Hulk Hogan and Mr. T — was very good except it was dumb to kill off Mickey with Rocky IV, V and VI still to come. Return of the Jedi — Not as good as “Empire Strikes Back.” Ewoks were dorky and some of the dialogue was terrible. But Jabba the Hutt totally deserved an Oscar and I liked the thing in the sand dunes that ate people and digested them for 1,000 years. Ouch! Return of the King — I saw it but can’t remember anything about it except for the 17 times the film almost ended but didn’t. Dark Knight Rises — Awesome. I’m in the minority but I thought it built to a better climax than “The Dark Knight,” which had an overly long and somewhat tedious third act. FWIW, I plan to be on a remote part of the planet far from theaters when the Batman-Superman movie arrives in 2015. I skipped “Man of Steel” because I already knew the director of the movie was not Supermanworthy. Transformers 3 — Haven’t seen any of them except for a few minutes of the first one on cable. Still upset at Shia LaBeouf over the fourth Indiana Jones movie — although he was okay in “The Company You Keep” earlier this year. Indiana Jones and the Last Crusade — Awesome. Not quite as good as “Raiders” but the sequence in which Indy on horseback rescues his dad from a Nazi tank was one of the best in adventure film history. Before Midnight — TBD, will catch soon on cable. First two were great.